This week we are pleased to feature a guest post from the co-creators of Kids Develop, an organization dedicated to bridging the gap between medically trained individuals and caregivers with a common goal of promoting normal development in the children of the future. Don't miss their new book, Your Child's Early Development Made Simple; a labor of their passion for parenting and a valuable resource for all parents of young children! What is development? A simple question asked by so many parents. A broad definition of development is the learning and mastering of skills that continue to build upon each other over time. These skills or developmental milestones are age specific achievements that the majority of children accomplish by a certain age range. Every developing child is unique and will achieve these milestones at different times within an associated age range. During the early years, the brain is like an incomplete drawing. The nerves and materials in the brain that carry information and allow children to progress in their development are not completely formed at birth. It is through the child’s experiences in their environment that allows these connections to start forming and growing in number. What we show and expose them to early on, largely predicts what kind and quality of connections will form in the brain. With proper monitoring, exposure, and intervention a child’s brain has the potential to “draw out” a masterpiece. Another way to think of these connections of nerves and growth of brain tissue is as a map being drawn out over time. With the proper exposure, a well-organized map develops allowing the child to easily follow it. This leads to the successful mastery of acquired skills. There are different types of development that professionals like to look at. We like to take a comprehensive approach and look at six main areas to be thorough. 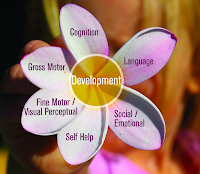 Additionally we also like to look at how these areas relate to each other because everything in the body is connected including the areas of development. These six areas of development are as follows: cognition (play skills), language, self-help/adaptive, social/emotional, perceptual/ fine motor, and gross motor. It is crucial as children are developing that they achieve and build upon the smaller skills or milestones before other more complicated skills are learned. This helps create a solid foundation from which to grow from. Now that we have a basic understanding of development, we can consider different developmental stages while traveling to make decisions regarding toys, safety, schedules, etc. Children like to have and do well with predictable routines and schedules. It provides a sense of order and security, which is important for them as their bodies are so rapidly changing. When making travel arrangements, consider your daily schedules and routines especially sleeping and feeding times. If feasible, take these times into consideration when making travel arrangements. For example, if you are traveling in the middle of nap or lunchtime is it possible to accommodate their needs at that time? Your travel arrangements of course may not always coincide with your child’s sleep and feeding schedule, but the more often you consider those needs when making your plans, the more likely you will have a happy child. Happy children make happy parents and great vacations! Certain partial accommodations can include making sure to bring along food (keep in mind you may not be able to warm it up) both for eating during a long road trip in the car and at times to offer in restaurants when your child may be picky about unfamiliar food. Something familiar from their sleep routine is great to bring along as well. This can be as simple as their favorite blankie. Do you think your child will tolerate morning trips or afternoon trips better? If traveling by airplane offer the bottle or breast to younger babies during take off and landing to help their ears with changes in pressure. For the older kids, have them drink from their sippy cups. Consider as well your final destination and whether you will need car seats. We always travel with a compact stroller and car seat that we check in when flying. To move around the airport we suggest babywearing (love the Moby Wrap)1 for the younger ones under a year and a compact stroller for toddlers. The strollers can be checked in at the gate. Plan ahead for your accommodations. Where will your baby sleep? Most hotels have cribs for the younger babies. When they get to the toddler stage and older, sometimes those cribs are too small. We found handy inflatable bed rails to use when sleeping on a regular bed. If using these bed rails, make sure to not leave your baby unattended and follow the products instructions. The one we like is from One Step Ahead called Stay Put Inflatable Bed Rail Set2. When considering room safety when traveling, Travel-Tot has a comprehensive travel childproofing kit3 with all the bells and whistles to convert your destination room into a child safe room. Another thing that has to be considered is how to clean bottles, spoons, sippy cups, etc. if in a hotel. With a little soap and hot water the OXO on the go drying rack4 is very handy as it includes the brush and drying rack, which is compact for easy packing. What happens if your baby gets sick? Make sure to pack your standard pain and fever medications such as Tylenol and Motrin. Also know where your closest Emergency Room is in case of an emergency. In our travel bags we bring an extra change of clothes, food, water/formula/milk, toys, diapers, wipes, Tylenol/Motrin, and a small blanket. Now that we have covered the basics lets quickly mention a few things about toys. In the first year of life, babies are really interested in exploring everything by mouth. This oral stage is a normal part of their learning and it typically continues until 18 months or so. Taking this into consideration you will need to bring along toys that are safe to explore by mouth and not choke on. For children 0-6 months: pacifiers, rattles, blankets, and teething toys are good options. At 6-12 months of age children begin using both hands together and enjoy making noise and seeing the reaction from a toy when they push it or shake it. This is called cause and effect. Good choices for this stage include blocks, soft books, sensory balls, play phones, and stuffed animals that have music when they are squeezed. 1-2 year olds are now more mobile and interested in movement. Good options for this age range are nesting cups, simple puzzles, books, crayons, balls, dolls, and cars. The older children will be able to help you choose and pack their toys. Give them a little bag to store their toys and watch their little faces light up as you give them the job of carrying their toys. For more detailed information regarding early childhood development please check out our simple to read newly published book at http://www.amazon.com/Your-Childs-Early-Development-Simple/dp/0615699634. You can also follow us on facebook at www.facebook.com/kidsdevelop for weekly tips and great articles! Arielle Rigaud-Riveira, M.D. Dr. Arielle Rigaud is a mother of two children currently living in South Florida with her family. She grew up mostly in South Florida but also has spent some time living in California. She received her Bachelors of Science degree from the University of Miami with a major in Psychobiology. She went on to achieve her medical degree at the University of Miami Miller School of Medicine. Her residency was completed at Jackson Memorial Hospital where she specialized in Pediatrics. She practiced as a Pediatrician in a private practice setting for five years and then began practicing Developmental Pediatrics. She always had a special interest in Early Childhood Development and it is through her practice that she realized the need to further educate parents on their children's developmental health. Nathalie McNeil, PT, DPT, CEIM. Dr. Nathalie McNeil is a mother of two children who currently lives in South Florida with her family. She received her Bachelors of Science degree from Florida International University with a major in Health Education, her Masters degree in Physical Therapy from Nova Southeastern University, and after practicing for some years went on to earn a Doctorate in Physical Therapy. Additionally, she is a Certified Educator of Infant Massage and has a passionate interest in educating parents about early childhood development. She has been working with children since 1999 and has been involved with early intervention evaluation and treatment since the beginning of her career. 2 Tips For Space-Saving Packing! Tip of the Week: Keep Rollin'! Boutique of the Week: Small Fryz! Family Road-Trip: Prep for Winter!